I never, ever vary my breakfast routine. I get up at dawn and putter about for a few minutes until my hunger wakes up. Then I move with a swiftness. I heat the skillet, toast a slice of homemade bread, and circle back to the skillet to crack in two eggs. The eggs barely make contact with the pan. (Over-easy is the term, but we called them "gook-out" when we were young.) Then the toast pops, and the butter drips down through its chewy holes, and I tuck in. Once my hunger wakes up it's a growling beast. After dipping my toast in the warm yolks and sliding the whites through the dripped-down melted butter, I can more leisurely turn my attention to things like sauerkraut and tea. It's a splendid breakfast, so splendid that when I make fancy breakfasts for other folks, I still make myself eggs and toast. Indeed, I never, ever vary my breakfast routine. Except for yesterday. And today. The folks at the farmer's market didn't bring eggs on Wednesday, being too busy with tomatoes. I am such a snob that I just can't tolerate the sight of ordinary commercial eggs anymore, not even the expensive organic omega-3 faux-family-farm eggs. They look flaccid and mucilaginous, not at all muscular and perky and bright like real eggs. So I went back to an old recipe I was saving for the dark of the year when real hens cease to lay. It's a recipe that was outdated before it was published a century ago. Helen Marsden, the endearingly nostalgic author, bemoans modern methods and the modern fear of inconvenience. But back then, "modern methods" meant baking powder instead of soda. And "inconvenience" was taking the time to soak your batter overnight. These days, breakfast itself is the great inconvenience. Take heart, though! She assures us that "the setting overnight ... is in fact a very simple and convenient process, consuming only a few minutes and doing its leavening work in accordance with nature's chemistry during the long hours of the night." It turns out that nature's chemistry is delicious, and truly easy. 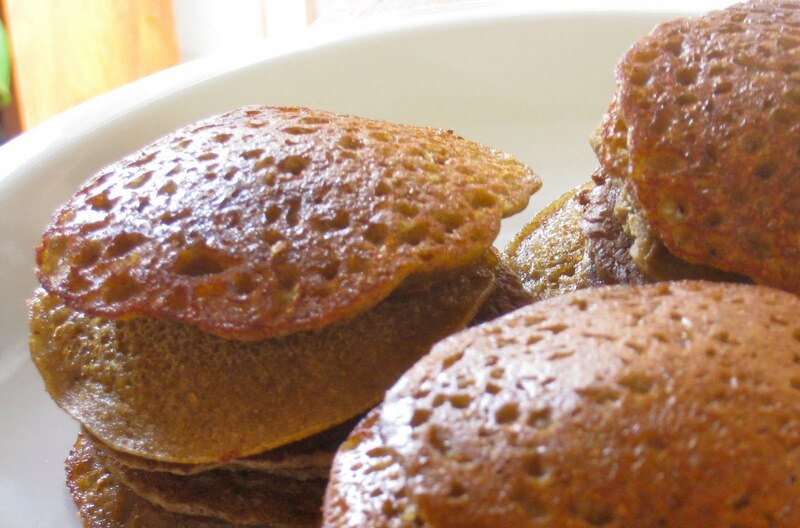 There's nothing in our modern repertoire quite like these buckwheat cakes. You know the spongey sour Ethiopian flatbread, injera? The cakes are spongey like that, but more delicate on account of the milk, and not sour. Like a cross between crepes and injera. They're tiny little chewy toothsome morsels. She calls it "light nothingness." Yes, that's true, but they're also satisfying -- they fill you up without the midmorning pancake crash. I ate a dozen and they kept me humming till lunch. This recipe makes enough pancakes for two hungry people, with maybe a few left over for a third person who generally prefers coffee to breakfast. The night before, put two cups of buckwheat flour in a large bowl with a cup of sour milk (buttermilk, kefir, whey, or clabber), and a cup of water. Whisk until all the lumps are gone. Add a teaspoon of salt and a tablespoon of molasses, and whisk in. I think Marsden assumes you're using toasted buckwheat flour (the grey-colored kind, readily available), but I usually prefer freshly ground untoasted buckwheat groats. Put a tea towel over the bowl, a plate on top to hold it on, and a thick dish towel over the whole thing. Set it somewhere warm. I put it directly on my stovetop over the hot spot from the pilot light. A radiator would also work. It shouldn't be so hot that it hurts to touch -- that would kill the fermenting bacteria. In the morning, heat a cast iron skillet over a medium-high flame. Don't let it smoke. Add a teaspoon of baking soda to the batter, and whisk it in until it's all bubbly and evenly distributed. Grease the skillet well (use ghee, lard, or bacon fat -- or butter, if you're careful not to burn it). Marsden says to use a "cooking-spoonful" of batter for each cake. It's not a lot. These are little guys. Put four or five in the skillet. Flip them when they have bubbles in the middle. Remove when they're brown on the bottom and re-grease the skillet before you put the next round in. Serve hot with gravy or butter. Or syrup, if you must, but I warned you about the pancake crash. Helen Marsden recommends an innovative pan-greasing device: a piece of fat pork stuck on the end of a fork. I suppose I could keep it handy in a little jar on the back of my stove; no more running around for the butter knife between pancakes. In fact, I could even use the fat-pork fork for my ova over-easy. 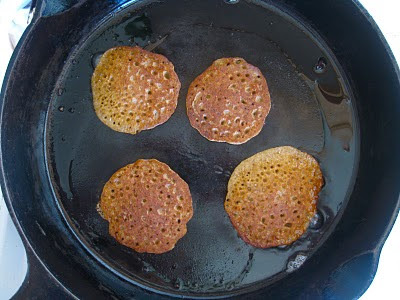 Wow, I just did a post on buckwheat pancakes also, and I used the word "toothsome" to describe them too! I'm happy to learn there are varying forms of buckwheat flour, which makes me wish I had a grain grinder about now so I could try them the way you made them. I LOVE your new book, and am so happy you also have this blog! Did I mention I LOVE! your book? Because I do! That's so funny! Buckwheat definitely = toothsome! If you're really curious about trying untoasted buckwheat, you could probably do a cup or two in a mortar & pestle (or food processor), a few tablespoons at a time. It's one of the easier grains to grind, being light & hollow. But some places only sell the toasted buckwheat groats -- untoasted ones are actually greenish. And I'm so glad you like the book!! We called them dippy eggs when I was little. Also, loving the cookbook! I captured some wild Texas yeast this weekend for my rye sour and made delicious bread. It has golden and chewy crust. Oh man, those look GOOD. R, Yes buckwheat groats can be crushed in a regular mortar or even a blender. Very delicate. I'm wondering whether the same procedure with teff would make a good njera. I've only made it once before with a supposedly authentic tecnhique that was back breaking. BuNot that I minded, but for a quick breakfast, this looks good. Some Doro wat on the side? And what does it suggest that both you and I never vary our breakfast habits? I'm enjoying your blog after reading about you in the Wall St. Journal. If you don't have a grain mill, you can put the buckwheat groats in your blender along with the buttermilk/water combo. and blend for several minutes. Measure out 4.5 oz. of groats for each cup of flour. This is about 3/4 cup whole groats/cup flour. I prefer untoasted too. You can add your other things to the blender and pour right into the skillet from there. It's true, blenders aren't traditional but it is a nice choice. So I have a question. Not really to do with the Buckwheat pancakes, but they look so good. I have your book and have been excitedly reading through it and have started to attempt some of the recipes. I am working on the wild yeast and am not sure if it is good or not. The first two days seemed to go fine, but now the third and forth day the barm has separated. There is "water" on the top and the rest of the goo on the bottom. Is this normal??? Sarah, a little liquid on the top of the starter is fine. It's the "hooch"--the alcohol that settles out. You can just stir it back in when you feed your starter. Have fun with it! Am loving your book. And this recipe looks wonderful. Who is Helen Marsden? Looked her up to no avail. All I know about Helen Marsden is that she wrote this article! There seem to be several Helen Marsdens, confusing the search.